The Arctic Agents slot machine from Microgaming does a great job of matching the feeling you get during cold Canadian winters. Set up on five reels and nine paylines, you'll see fish, bears, penguins and more with skills to help them accomplish their missions. 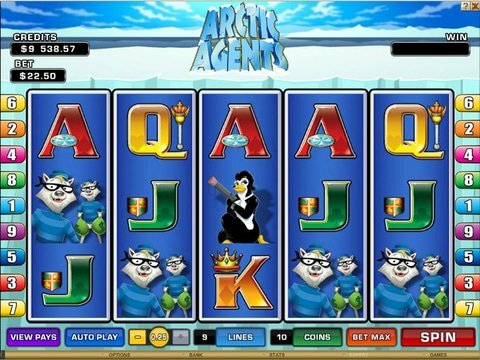 You can try it out right here on this page with the Arctic Agents free play slot demo available for your review with no download and no registration required. You'll be able to find it on your computer and on most mobile devices. You can choose wagers between a penny and $22.50, so this one of those slot machines that is dedicated to budget gamblers. The features here are simple, but they'll offer you a lot of fun. The Penguin is the wild and will double any prizes it helps to create. The Igloo scatter (which is oddly modern and is the Agents' headquarters) triggers free spins, and you will choose an agent that determines the number as well as the multiplier associated with it. You don't get to choose these because they are determined at random. There's no second screen bonus round here, but the unique functionality of the scatters makes up for this. If you want to try a chilly game for some real cash prizes, then the Siberian Storm slot from IGT is another fantastic choice. It's just as cold as Arctic Agents, but it is focused more on the Siberian Tiger than anything else. There are 720 ways to win, frequent stacked wilds, and scatters that can provide some nice instant wins. However, the real excitement comes in the Tiger Eye bonus that provides eight free spins at first with extra being triggered as the feature progresses. However, this is difficult to trigger since the Eye must appear on all five reels at the same time to get it. The maximum in-game jackpot is $3000.